Lack of English proficiency is a key constraint affecting the employability of Sri Lankan graduates in the private sector, according to a recent Labour Demand Survey conducted by the Department of Census and Statistics. Although teaching English as a second language to all school children has been a key social policy of successive governments of Sri Lanka since the early 1950s, Census of Population and Housing data indicate that English literacy is just 22% among Sri Lanka’s population above 15 years of age. 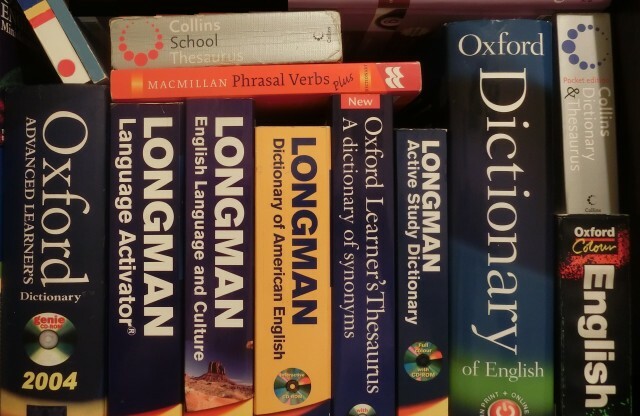 Recognising the critical need for strong English language skills in today’s context of increasing globalisation, technological advancement, and a modernized labour market, recent government policy has devoted attention to addressing persistent gaps in English education; the 2018 budget allocated Rs. 50 million for the establishment of a center for training English teachers, while the previous government announced targets to double the number of English teachers over the 2011—2020 period. Yet, are such policies the need of the hour? Based on an analysis of available data, this blog argues that what is more important is to address disparities in access to quality English education, rather than solely focusing on improving overall quality. Since 2003, the National Educational Research Centre (NEREC), based at the University of Colombo, has administered tests in the first language (Sinhala and Tamil), mathematics, science, and English to grade four and grade eight students in a representative sample of schools across the country. The latest assessments from 2015 and 2016 reveal low national English mean scores of 54% and 36% among grade four and eight students, respectively. Even more concerning is that these national averages mask considerable variation in scores both between and within schools. As Figure 1 shows, both fourth and eighth graders in urban schools outperform their rural school counterparts by significant margins. Further, there are wide disparities in scores within schools, particularly in urban schools. For instance, while 21% of eighth graders in urban schools scored within the 20—29 mark range, another 20% scored above 70. Among fourth graders, 23% scored below the pass mark of 40%, while 32% scored above 80%. In fact, student heterogeneity in English has been identified as an issue in urban schools, primarily due to national schools that admit students from rural disadvantaged schools—for instance via the grade five scholarship exam—who have had limited exposure to quality English education both at home and at school. This means that a typical classroom consists of students on both extremes of language proficiency, presenting English teachers with the challenging task of catering to different competency levels. Contributing to the problem of unequal student outcomes is an inequitable allocation of English teachers across schools. Contrary to what one would expect, recent IPS researchreveals that Sri Lanka not only has more than adequate overall English teacher numbers, but also an excess of subject-qualified ones—i.e. those with either a university degree in English or who have been specially trained to teach English. This is in contrast to sizeable shortages of subject-qualified mathematics and science teachers in the country. The problem appears to be that most of these qualified English teachers are concentrated in more privileged schools, leaving students in remote schools at the hands of unqualified teachers. 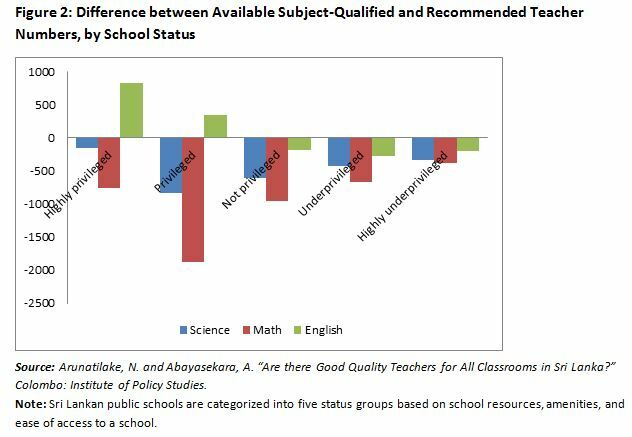 As Figure 2 indicates, while qualified mathematics and science teachers are lacking in all school types, qualified English teachers are deficient only in underprivileged schools; privileged schools have more than enough competent English teachers. It is thus not surprising that, students from rural primary schools who enter urban schools lack basic English skills. Children from rural and less privileged backgrounds are doubly disadvantaged as they lack access to good English education both at home and at school. As a National Education Commission Report puts it, in Sri Lanka English “continues to be an agent of social differentiation”, with good quality education and jobs being limited to a select English literate population. The fact that many students miss out on being taught by qualified English teachers despite Sri Lanka having an oversupply of them is a deep injustice. A potential measure to deal with student heterogeneity in classrooms is to cater to students of different levels of competencies. 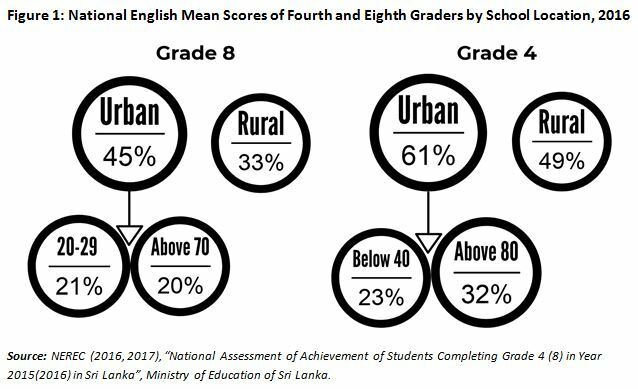 A study among a sample of grade seven and 10 students in Sri Lanka grouped students in a given classroom into three levels based on marks obtained for English at the second term test. Students in these three different levels were taught using different activities, in line with competencies identified in the Teacher Instructional Manual. Student performance showed improvements as early as the third term test, and were also evident in end of year tests, especially among less able students. Teaching at different levels within a given classroom is however a challenging task, and it is important that teacher training programs include modules on related teaching techniques and preparation of learning material. To tackle inequities across schools, efforts need to be directed at improving teacher allocations to ensure that disadvantaged schools are staffed with good English teachers. A study on teacher education notes that many existing policies on teacher deployment and transfers in Sri Lanka are limited to paper, with some teachers using political and other influences to get transfers to schools of their preference. This is in part possible owing to the current practice of recruiting teachers by the Ministry of Education at the central level, which affords flexibility in moving between schools. Giving schools powers to recruit teachers at the school-level could restrict teacher mobility. While less privileged schools may not necessarily succeed in attracting qualified teachers, with more restrictions on teacher movement, recruited teachers in these schools will gain experience over time, which, along with in-service training, would improve teacher quality. School-level recruitment has already been implemented in Estate sector schools among Tamil medium teachers who are in short supply.